When Lily, an extended care nurse in white pumps and a mustard cardigan, arrives at this grand old country house to look after its aging and infirm owner, she chides herself on the first night, 'No snooping!' However, that discipline is short lived, as I Am The Pretty Thing That Lives In The House (hereafter, Pretty Thing) is designed to snoop around the place in slow motion. This is sophomore feature from Osgood Perkins (February), who confidently and deliberately turns the screw aiming for classic chills over modern thrills. In this current landscape, littered with over-sweetened junkfood like The Conjuring, this type of ghost story is a breath of fresh air, even if Pretty Thing is a bit feather-weight in the end, I will gladly embrace quiet goose-pimples over pounding jump-scares. 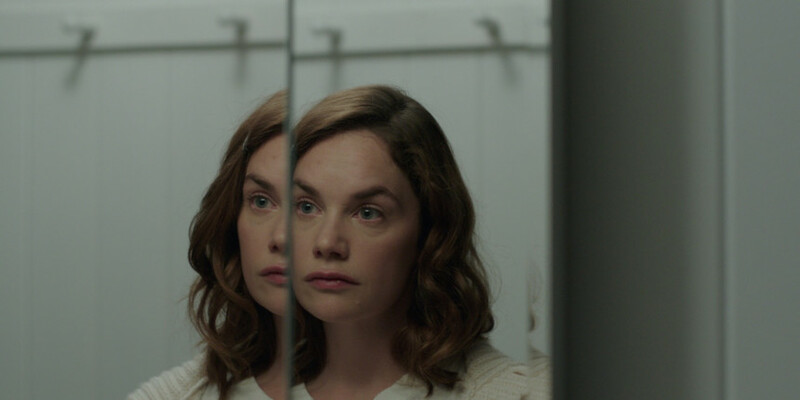 After an impressionistic opening sequence - "faces on the wrong side of wet windows" - eases us into the films delicate headspace, our proper introduction to Lily (Ruth Wilson, with tight hair and Lisa Loeb glasses) is with her looking directly into the camera. This is not so much a fourth wall break, but rather a somber confession or perhaps a promise. In a bold storytelling move, Lily lays everything out, plotwise, what is going to happen and when. Her narration will continually ebb and flow over the course of the film, which is loosely structured, via quite fade-to-black transitions as if they were breaks in both chapter and verse. In a come-out-of-retirement cameo, comedienne (and Stepford Wife) Paula Prentiss plays a stricken old writer, Iris Bloom, who is practically paralyzed and in need of live-in care. Barely able to utter a word, Bloom will only refer to Lily as Polly, one of the characters of her novels. Indeed, the novel becomes the chief course of Lily's snooping, as she digests the book while passing the long days and nights in the empty house. The vintage tape-deck, and bakelite telephone with a magnificently long cord (the most nostalgic detail for me is the way Lily wraps the cord around herself while talking to her chatting to friends) and a faded Grateful Dead t-shirt all suggest a 1980s setting, but the film is not a slave to the eras horror-homage as say, Ti West's House of the Devil. It might even be simply that everything in the self-contained environment is just old stuff, the film is self contained enough to make time and place irrelevant. This, as is everything in the film, intentional. The novel in the film evokes pulpy and battered beach books of the 1960s leavened with gothic romance. Rightfully or wrongfully, the book itself makes far more of an impresssion than any of the characters, which are ciphers, almost even props (note, Bob Balaban as Lily's boss). Perkins skillfully cuts back to a young Bloom in librarian spectacles with a cigarette dangling from her mouth pensively clanking away on typewriter in the same house, and further cuts to the story she is writing involving the disapparance of newlyweds, Polly and her husband somewhere in the late 1800s. The house is a house of stories, some moldier than others but it is images and ideas, both abstract or concrete, rather than the humanity that drives Pretty Thing. Blessed with some clever transitions between all of these moments in time, as if to say an ending is not really an ending, but rather just another beginning in an ongoing cycle. Dedicating this film to his father, the legendary Anthony Perkins (who knew a thing or two about creepy old houses), the son goes so far as place the ghost of his father in the film by way of a color western playing on VHS at one point. All those possessed in the act of telling stories eventually become captured ghosts for the next generation.